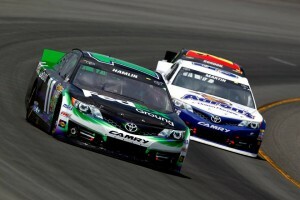 Denny Hamlin started 17th in Sunday’s NASCAR Sprint Cup Series Party in the Pocono’s 400 at Pocono International Raceway and appeared headed for a top five finish, but handling issues late in the race left him with an eighth-place result in the #11 FedEx Ground Toyota Camry. With qualifying rained out and the lineup determined by owner points, Hamlin started far back from where he usually grids but immediately began moving forward. He was up to 14th by lap 21, 12th by lap 32 and then ninth by lap 51. Like many others his car was loose under the bright, sunny skies but Darian Grubb and Hamlin’s FedEx Ground crew kept working on the chassis while servicing the car in record time. Hamlin moved up another position in the standings to now rank 25th, 76 points out of the 20th position. The NASCAR Sprint Cup Series returns to action next weekend at Michigan International Speedway for the Quicken Loans 500 on Sunday, June 16.